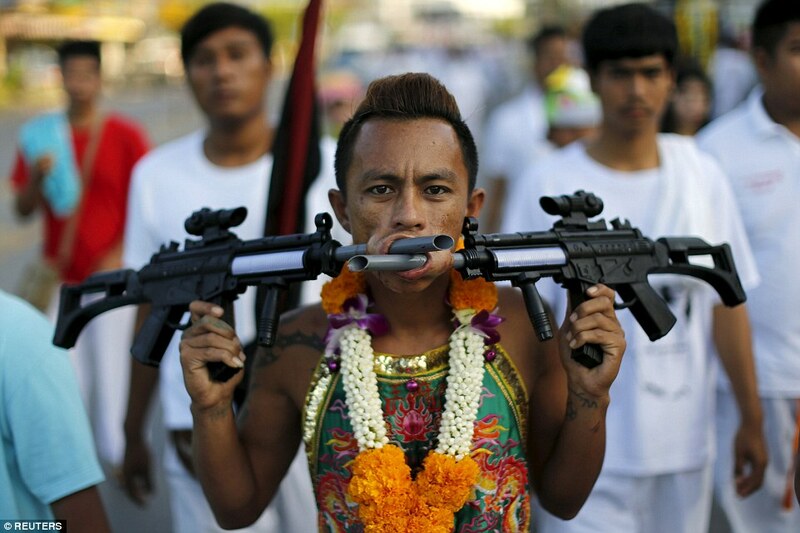 Just in case you were still wondering what to dress up as for Halloween, along comes the Phuket Vegetarian Festival in Thailand. 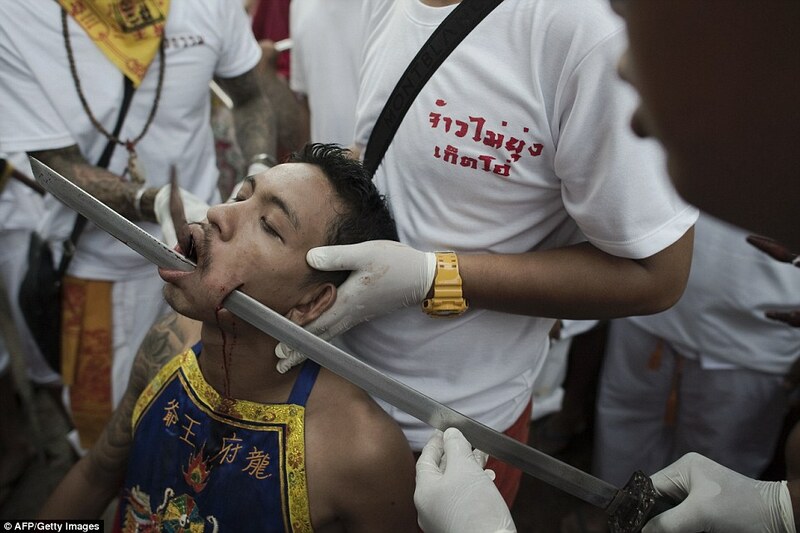 On display over the course of the nine-day event are hundreds of devoted male followers willing to risk serious bodily harm in the short term, to gain long life and good luck the rest of the year. Participation in the festival is not for the faint of heart, nor is viewing the pictures included below. 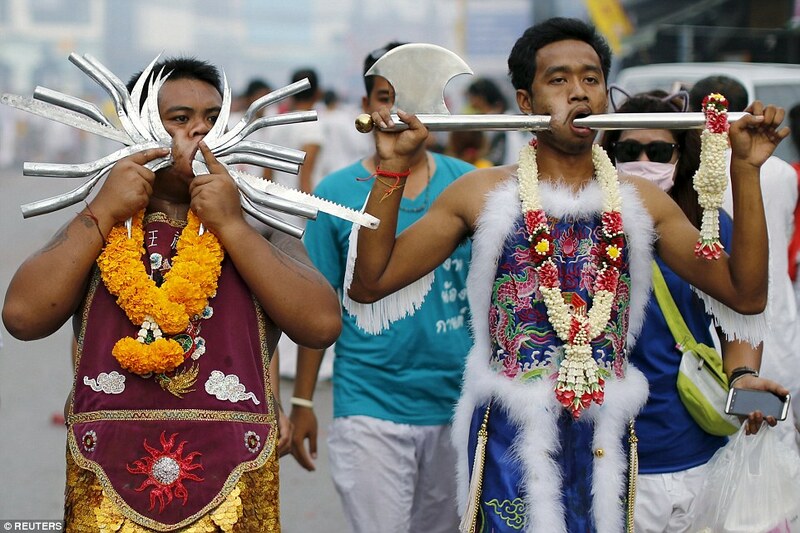 The event focuses on the worship of the Nine Emperor Gods. In order to achieve the blessings of these gods, devotees must adhere to a strict vegetarian diet and pray for a purification of their body and mind, which, if success, will result in peace of mind and good fortune. 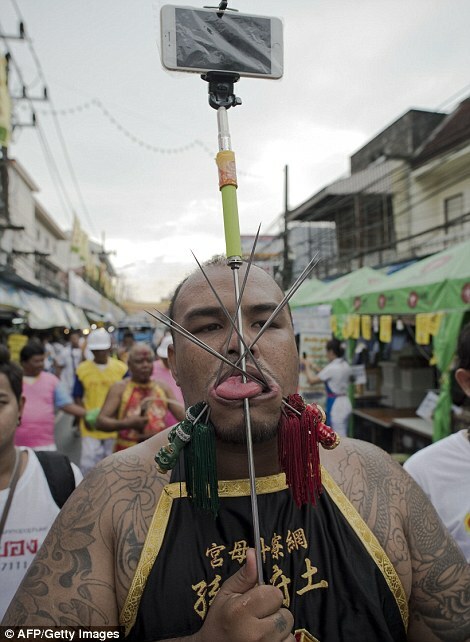 Strangely enough, part of this purification of vegetarians involves meat skewers: human meat skewers. 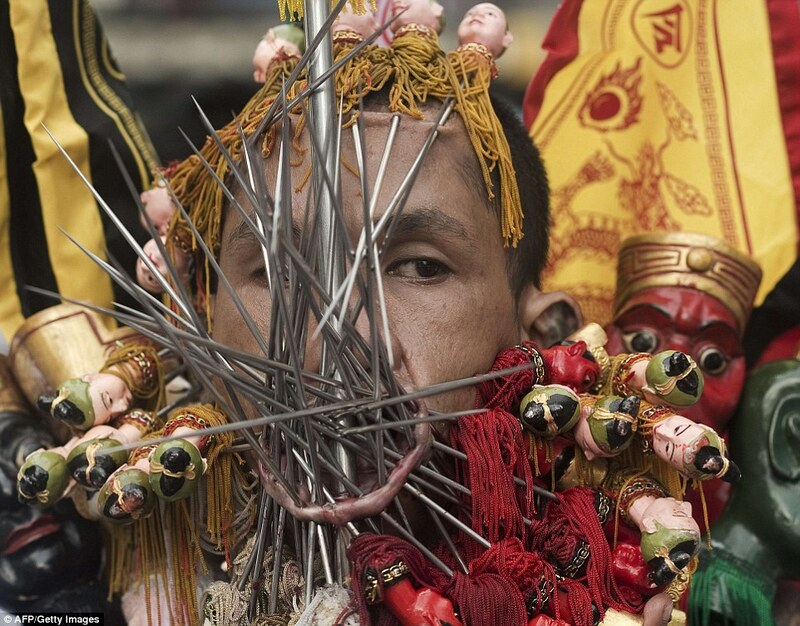 As part of the meditative process, the extreme body piercing involved in the festival is believed to remove evil spirits from the men’s bodies. This process is further assisted by religious mediums who, throughout the festival, summon and commune with the spirits. 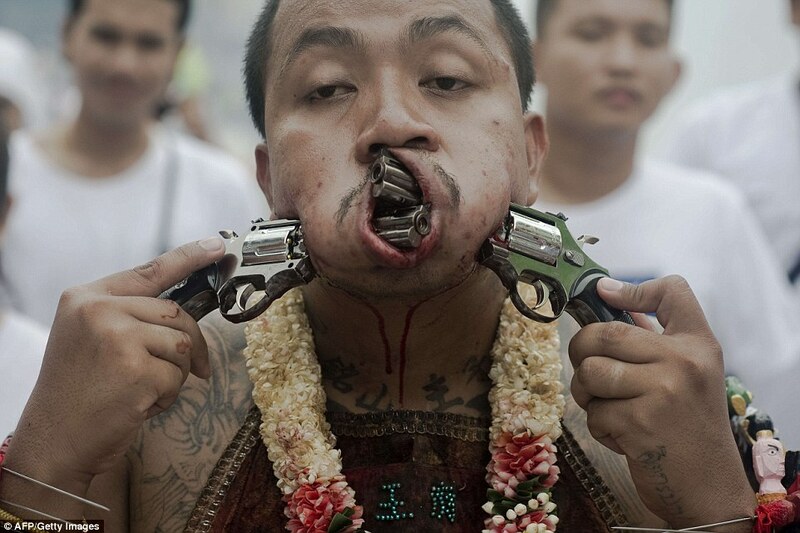 Successful removal of these spirits is apparent when little or no blood results from the piercings. 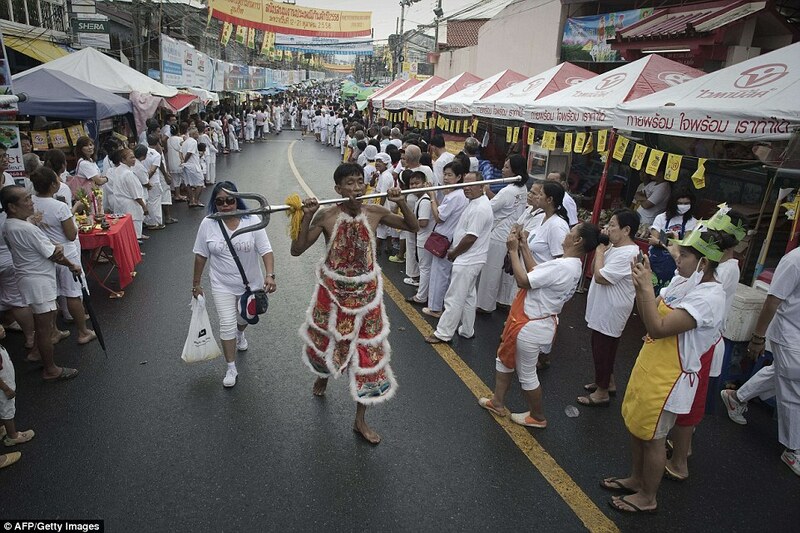 The roots of the festival are a bit unclear, but the most commonly accepted view is that during the middle of the nineteenth century, a Chinese opera troupe arrived in Phuket, but was quickly plagued by malaria. To combat this illness, the fifteen members of the company abstained from meat and prayed to the local Nine Emperor Gods. Miraculously, all the members survived their battle with the disease. 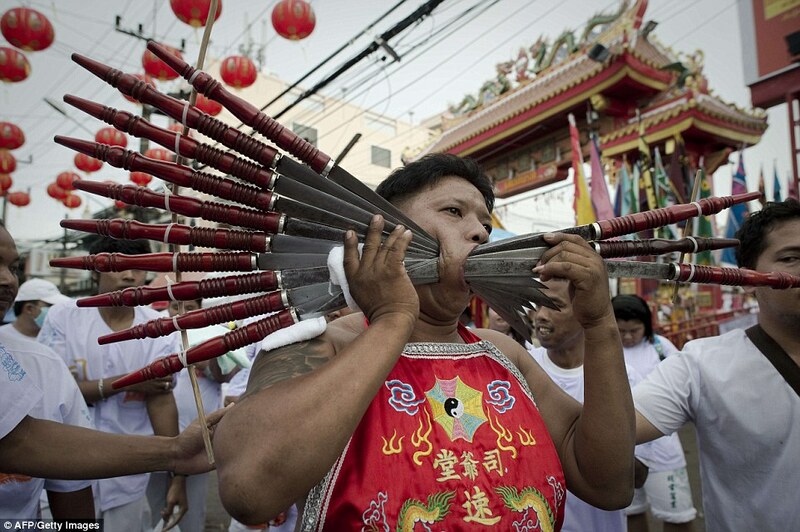 Soon thereafter, locals began to annually emulate these dietary practices, during the ninth month of the Chinese lunar calendar, to commemorate the favor of the gods. Over the years, the events surrounding the festival grew to include ceremonies demonstrating the worthiness of devotees. 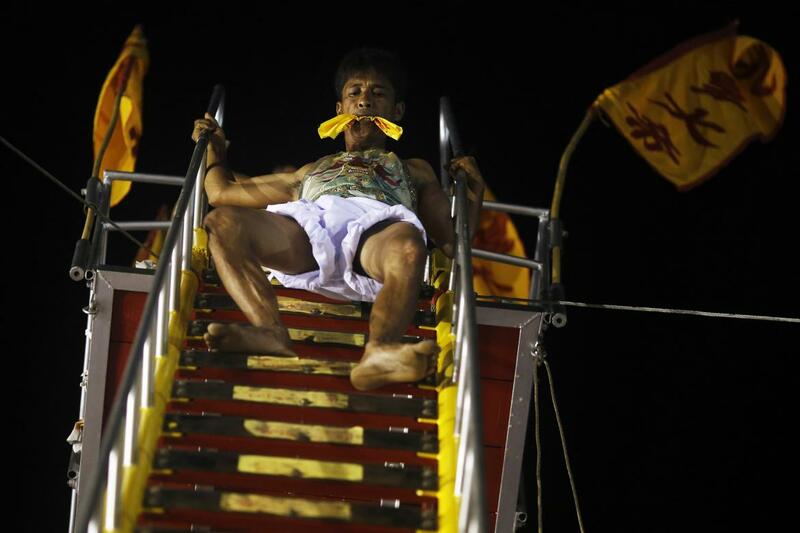 In addition to the ritual self-mortification of the cheeks, there are also individuals who firewalk and enter a trance as they climb a ladder of sharp blades that is over twenty-four feet high. All of this takes place in a lively atmosphere, surrounded by vendors selling vegetarian food. 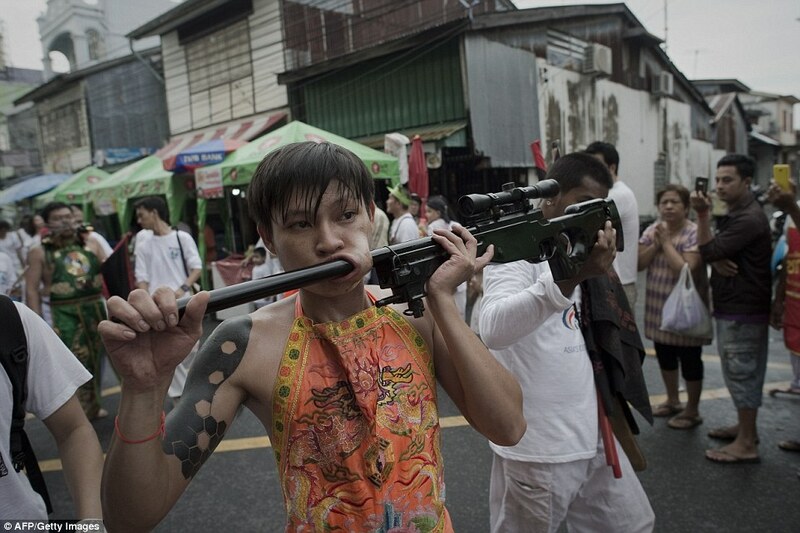 Such activities center around the Chinese Samkong Shrine and the Ban Tha Rue Shrine. Most locals, and even visitors from abroad, parade their household gods to the temples to receive a spiritual boost that protects their home for the following year. 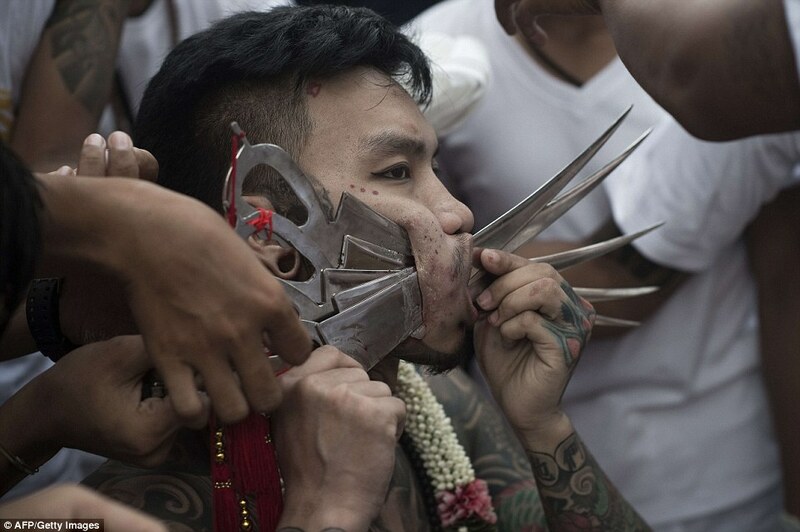 Religious practices around the world can certainly be weird, but there are few that we have come across that are stranger than slicing open your cheeks, placing two assault rifles in the slits, and then parading through town. But, as the video below shows, at least there are medical staff on hand to pour rubbing alcohol on the wounds.